As the father of two girls I am always trying to find ways to instill in them ways in which they cab act like the princesses that they always want to be when they pretend. This book is written in such a way that young girls can read for themselves. 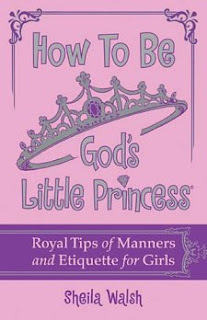 It is written in such a way that it is easy to understand and gives practical advice such as how to dress modestly and with flair, how to include others, how to treat adults, and even how to wear a tiara. I liked the fact that it has different quizzes, crafts and puzzles that will encourage your girls to dream big. I loved this book and I have let my eldest try to read this and I have read with her as well. The book is a great guide that I feel will help to encourage my girls to live the right way and be the princesses that I know that they can be. This is a book for anyone who has daughters or anyone who works with girls!